Oscar Knox, the County Antrim boy whose long battle against an aggressive form of cancer captured the hearts of many people in Northern Ireland, has died. On Friday they tweeted: "Our beautiful, amazing and much loved son Oscar James Knox gained his angel wings yesterday afternoon. Sleep tight little man." In a full statement, his family said: "Oscar has brought unimaginable joy to our family with his smile and his infectious personality. "Our little superhero achieved so much in his short life and inspired so many people throughout the world to do so many amazing things. It is something we are incredibly proud of. "We wish to take this opportunity once again to thank all of Oscar's followers the world over for everything they have done for us and for the wonderful kindness and generosity that has been shown. "We also want to thank the teams at the Royal Belfast Hospital for Sick Children and NI Children's Hospice whose kindness and compassion has been nothing short of amazing. "Nothing can ever take the pain away but knowing we were supported so much and that Oscar was loved so much, brings great comfort." The family have asked for privacy in the coming days. A ceremony, described as a "celebration of Oscar's life", will be held in St Bernard's Church, Glengormley, on Sunday, 11 May. "We welcome friends, family and supporters of Oscar to join us in procession from the NI Children's Hospice at 10.15am on May 11 and onwards to St Bernard's Church." A strictly private cremation will follow. Oscar was first diagnosed with the disease in November 2011. 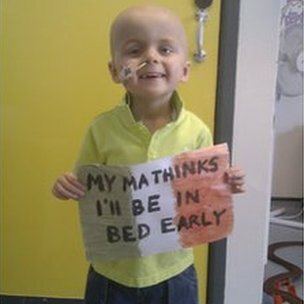 After intensive treatment, 'Wee Oscar' was finally given the all clear in April 2013, but it returned in August 2013. In October 2012, he received specialist treatment in America after his family reached their £250,000 fundraising target to pay for the immunotherapy treatment. After his initial diagnosis, his parents set up the Twitter account so they could update friends and family on Oscar's condition each time he was in hospital. However, the account quickly attracted thousands of followers. Among them were families whose children have the same condition. The Twitter account became a phenomenon in June 2012, after a group of Irish football fans posed for pictures in Dublin airport before heading off to the European football championship with a flag saying "Angela Merkel thinks we're at work". Oscar - who had been allowed to stay up late to watch the matches - and his father Stephen, made their own flag saying "My ma thinks I'll be in bed early" and then tweeted a picture of it. The 'Merkel lads', as they became known, were so touched by the picture they decided to auction their flag to raise money for the toddler. Oscar, was a fan of Glasgow Celtic and the football club joined in the fundraising campaign. Last July, when Belfast side, Cliftonville, went to Glasgow for their UEFA Champions League qualifier, Oscar donned his green and white shirt and led Celtic out before the game as team mascot alongside captain, Scott Brown. In a statement on Friday, Celtic said: "This is absolutely devastating news and our thoughts and prayers are with Oscar's parents, Stephen and Leona, and his little sister, Izzie, at this desperately sad time. "We can't even begin to understand the pain of their loss, but I hope that there will be a small measure of consolation in knowing that there was genuine love and affection for Oscar from the Celtic family throughout the world. "Oscar's courage throughout his illness was truly inspirational, and it was a real pleasure for everyone at the club to meet Oscar when he was our team mascot last July." Belfast boxer Carl Frampton said it was very sad news. "I'm kind of in shock, because with the wee man, I knew he was very, very sick, but you always expected him to get better because he is such a fighter," he said. I was walking down a street in Belfast city centre about a year ago when a mother was walking along with her young child. The child stopped and looked at a picture of Oscar Knox in a shop window and asked his mother why that little boy had no hair. She explained that he was very sick and told her son he was being treated for cancer and that had made his hair fall out. The child nodded and asked a few more questions with this new understanding of cancer. It was two years ago when BBC News NI first met Oscar Knox and since then his family has tirelessly campaigned to raise awareness of high risk neuroblastoma and the importance of blood donations. His parents Stephen and Leona began their Twitter account to provide a support network for other parents whose children had the same condition. Raising awareness has always been top of his parents list. Blood donations in NI and understanding of high risk neuroblastoma did increase during their campaign. 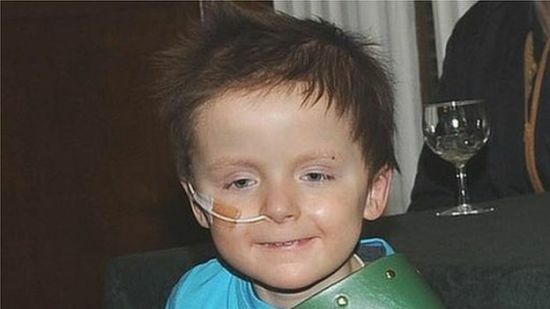 Oscar Knox was a normal five-year-old who loved pizza, Sugarpuffs, playing with his sister Izzy, Scooby Doo and Spiderman. Oscar loved his doctors and nurses and they adored him. It will be a tough time for the medical staff who have supported him over the last two and a half years.